Go if: Swan Lake is a masterpiece of classical ballet and should be experienced at least once in one’s lifetime, preferably with a ballerina in full command of the technical and dramatic challenges of the central role and in a production that honours Tchaikovsky’s truly “epic” score. Skip if: You are hoping that Natalie Portman will make a stage appearance. NB: do not expect The Dying Swan – a solo dance choreographed by Mikhail Fokine for ballet legend Anna Pavlova to music by Camille Saint-Saëns – to feature in the ballet, even though records indicate this was once incorporated into a Swan Lake production by All Star Imperial Russian Ballet that toured the US in 1911. Birdwomen, aquawomen and shapeshifting females in general have long featured in Eastern and Western tales. A number of these are consistently cited as influences on Swan Lake: Der geraubte Schleier (The Stolen Veil) a tale about enchanted doves by German author Johann Karl August Musäus, Wagner’s Lohengrin (featuring a swan knight who symbolises purity), Andersen’s The Wild Swans and not least Pushkin’s Tzar Saltan (The Tale of Tsar Saltan), where a prince saves a wounded swan who reappears as a woman to marry him. Contemporaries of Tchaikovsky have also noted the composer’s interest in the life of Bavarian “Swan” King Ludwig II, a link which is cleverly explored by John Neumeier in his 1976 ballet Illusions Like Swan Lake. In 1875 Pyotr Ilyich Tchaikovsky was engaged by the Bolshoi Theatre to write the music for Swan Lake. Although Vladimir Begichev (an Intendant of the Russian Imperial Theatres in Moscow) is said to have written the ballet’s first libretto with the assistance of Vasily Geltser (a dancer), it is very likely that Tchaikovsky also contributed. Not only was the composer familiar with legends of swans, he had also shown interest in the theme years earlier with The Lake of the Swans, a miniature ballet for his sisters’ children. The argument was very different from the Swan Lake we now know: Odette, daughter of a good fairy, is being pursued by her “wicked witch stepmother”. Her grandfather keeps her and companions safe at a lake by night, allowing them to fly about as swans by day. Odette wears a magical crown which protects her from the witch. Siegfried falls for her but betrays her at a ball. Odette refuses to forgive him, so he snatches her crown in desperation. The lovers are now at the mercy of the witch and the waters of the lake engulf them. Julius Reisinger choreographed the ballet but little is known about the extent of his collaboration with Tchaikovsky. Swan Lake premiered 4 March 1877 with Pelagia “Paulina” Karpakova as Odette and Victor Gillert as Prince Siegfried. Although the ballet was not considered a great success it was given a reasonable number of performances and was kept in the Bolshoi’s repertory for 6 years. During this time a new ballet master, Joseph Hansen, revised Reisinger’s “unimaginative and altogether unmemorable choreography” also cutting and adding incidental music to Tchaikovsky’s score in order to suit specific performers, a common practice then. Swan Lake got its “second wind” in 1893, the year Tchaikovsky died. The composer had created two important ballet scores - The Sleeping Beauty (1890) and The Nutcracker (1892) – and plans to bring Swan Lake to the Mariinsky had existed for a while. At a commemorative concert to honour the composer, Marius Petipa and his collaborator Lev Ivanov presented Act II of Swan Lake. The extract was warmly received and gave Petipa/Ivanov the extra incentive to stage a full-length version. With the permission of Tchaikovsky’s brother Modeste they revised the libretto and engaged conductor Riccardo Drigo to rework the score for this all new Swan Lake. 1901 – Swan Lake returns to Moscow, in a staging by Alexander Gorsky after the Petipa/Ivanov St. Petersburg production. 1908 – 1911 - The ballet finally becomes a Russian export as Anna Pavlova tours an abridged version to Scandinavia and Germany (1908). A full version is staged around 1909 in Europe. In London, Swan Lake is performed by a visiting troupe of “Star Russian Dancers” (1910), while in the US it is given by Mikhail Mordkin and his “All Star Imperial Russian Ballet” who incorporate Mikhail Fokine’s Dying Swan solo into the staging (1911). 1911 – Diaghilev’s Ballets Russes stage the first major non Russian (abridged) production of Swan Lake. The ballet remains in the company’s repertory until 1914 and is later revived from 1923 to 1926. 1933 – Ballet teacher Agrippina Vaganova scraps the Petipa-Ivanov Swan Lake and is the first to adapt the ballet to suit the demands of the new Soviet regime. Mime is removed, the action switches from the Middle Ages to early 19th century and the roles of Odette/Odile are split between two different ballerinas. 1934 – Ballet notator Nicholas Sergeyev stages the first full-scale British Swan Lake at Sadler’s Wells (Vic-Wells Ballet) with Alicia Markova as Odette/Odile and Robert Helpmann as Prince Siegfried. The current Royal Ballet production (by Sir Anthony Dowell) is based on these Sergeyev notations. 1940 – San Francisco Ballet stages and tours the first full-length American production of Swan Lake (by William Christensen “after Petipa and Ivanov”). Catherine Littlefield produces “Swan Lake on ice”. American Ballet Theatre (then Ballet Theatre) first performs Act II of Swan Lake in New York with choreography by Anton Dolin “after Petipa and Ivanov”. 1950 – Konstantin Sergeyev stages a new Swan Lake for the Mariinsky (then the Kirov) after “Petipa and Ivanov” but including some bits of Vaganova and Gorsky. Under the Soviet regime the tragic ending is substituted for a happy one, so that in the Mariinsky and Bolshoi versions Odette and Siegfried now live happily ever after. 1956 – Vladimir Bourmeister choreographs a new Swan Lake for Moscow Stanislavsky Ballet using part of the original 1877 score. 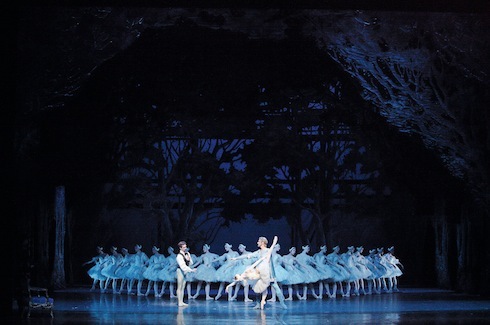 He introduces a prologue (Odette is seen picking flowers for a bouquet before Rothbart captures her) and emphasises the psychological aspects of the tale while preserving Petipa and Ivanov’s white acts. This production is eventually adopted by La Scala (where it still remains in repertory) and the Paris Opera Ballet. 1964 – 1984 - Rudolf Nureyev creates and performs in a Swan lake production for the Vienna Opera. Later, as director of the Paris Opera Ballet he creates another version of the ballet, facing hostility and skepticism from his dancers who are very attached to the Bourmeister staging. Nureyev extends the male role (Siegfried has significant solos and is no longer just a partnering accessory) and introduces the concept of Odette/Odile as figments of the prince’s imagination. He also adapts the famous “Black Swan” pas de deux into a pas de trois, giving Rothbart a dancing part. This new version premieres 20 December 1984 at the Palais Garnier with Elisabeth Platel, Charles Jude and Patrice Bart. 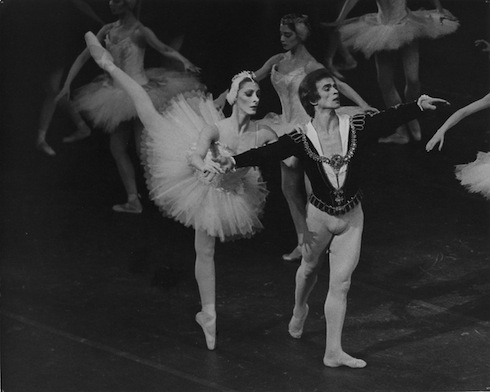 1987 – 1990 – Roland John Wiley, a musicologist, works with Sir Anthony Dowell in a new “authentic production” of Swan Lake for the Royal Ballet (1987), while Konstantin Sergeyev and his wife, Natalia Dudinskaya stage for the Boston Ballet an “American-Soviet” production danced by a mixture of Russian and American dancers (1990). 1996 - 1999 – Peter Martins choreographs a new full-length Swan Lake for the Royal Danish Ballet with costumes and settings by famous Danish painter Per Kirkeby. This production is “after Petipa and Ivanov with hints of Balanchine”. Most importantly the ballet has a darker ending than most Western productions: the spell remains unbroken, with Odette and the prince forever separated. In 1999 this production is adopted by the New York City Ballet. 2000 – ABT unveils their new Swan Lake production by Kevin McKenzie featuring a prologue where Rothbart is seen transforming the maiden Odette into a swan. About half an hour of the complete score is omitted from this staging. 2010 - 2011 - Darren Aronofsky directs The Black Swan with Natalie Portman in the role of Nina Sayers, a ballerina facing the challenge of debuting as the Swan Queen. Interest in Swan Lake is renewed as a new public seeks to discover the ballet within the movie. The Royal Ballet dances its 946th performance of Swan Lake at the Royal Opera House with Zenaida Yanowsky leading the first cast. A birthday party is being thrown to celebrate Prince Siegfried’s birthday. When Siegfried arrives he is greeted by his tutor, friends and peasants. As they all dance celebrations are interrupted by Siegfried’s mother. Worried about her son she tells him that he has to choose a bride at his birthday ball the following evening. Siegfried is reluctant but has no choice but to obey his mother. The tutor and his friends do their best to cheer him up and as darkness falls his friend Benno sees a flock of swans in the sky and suggests they go out on a hunt. They take crossbows and set off. As they chase after the swans, Siegfried and his friends have become separated. Siegfried is just about to shoot one of them when he is frozen by the sight of it transforming into a maiden. At first terrified of him, she starts to trust him when he promises not to harm her. Through ballet mime the Swan Queen, Odette explains the spell the evil spirit Von Rothbart has put on her and companions. By day they are swans, yet they return to human form at night. The spell can only be broken if a man swears to love her and to be faithful to her. Rothbart now appears. Siegfried is about to shoot him but Odette prevents him from harming the spirit, telling him that if he does so the spell will never be broken. 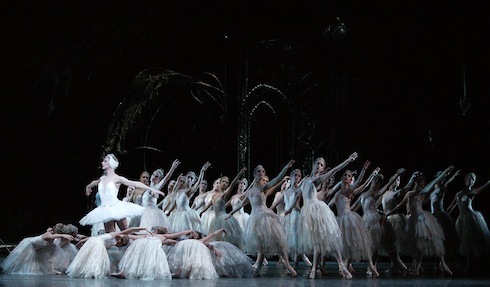 As Siegfried exits in pursuit of Odette, Rothbart summons the other swan maidens. Odette enters and dances a lyrical pas de deux with Siegfried where slowly she yields to him and he earns her trust. As dawn arrives Rothbart returns and Odette morphs back into swan form. It is Siegfried’s birthday ball, as his mother orders him to dance with six princesses and choose one as a bride. While he tries to argue that does not love any of them, Rothbart, in human form, arrives with his daughter Odile. Despite being dressed in black she looks uncannily like Odette. The guests now sit and watch dancers from Spain, Hungary, Naples and Russia perform in honour of the prince. After the entertainment is over Siegfried dances a pas de deux with Odile (known as the Black Swan Pas de Deux). She tries to channel the same swan-like movements as Odette to seduce the Prince. As they dance Odette appears in the background to warn him but Rothbart and Odile ensure that the Prince is oblivious to the apparition. The Prince is completely taken with Odile and swears to love her forever. 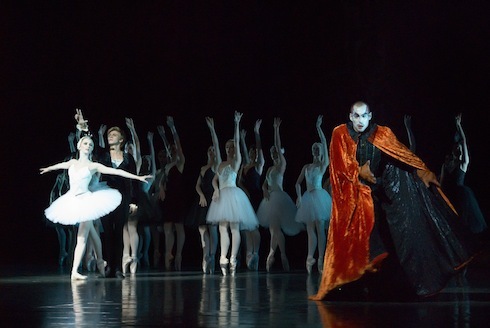 Rothbart reveals a vision of the grieving Swan Queen, before disappearing with his daughter. Frantically, Siegfried hurries back to the lake as his mother collapses. Siegfried prefers to die alongside Odette. As the pair throw themselves into the lake, the spell is broken, Von Rothbart is destroyed and the lovers are reunited in heaven. Siegfried fights Rothbart. The power of his love for Odette destroys the spirit, the spell is now broken; the lovers are reunited and the swan maidens are also free. Swan Lake is one of the most successful ballets of all time and there are simply too many versions to list. For an interesting comparative review of several productions available on DVD read “Swan Lake month” a compilation at You Dance Funny, So Does Me. George Balanchine’s Swan Lake for NYCB (1951). This one-act version premiered with Maria Tallchief as the Swan Queen. It is based on Ivanov’s choreography for Act II and uses music from Acts II and IV – ie. both lakeside acts – as well as a duet from Tchaikovsky’s opera Undine. John Neumeier‘s Illusions Like Swan Lake for Hamburg Ballet (1976). In this version the real life story of Swan King Ludwig II of Bavaria is woven into the plot. The choreography combines passages by Petipa/Ivanov with new dances and scenes. The ballet finishes with Ludwig’s death by drowning while confined to an asylum, set to the conclusion of Act 3 (the ballroom). This work anticipated both Bourne’s and Murphy’s own interpretations and is still routinely performed today. Matthew Bourne’s (1995) This very successful production represents a more radical departure from traditional Swan Lakes by featuring male dancers, amongst whom the figure of a young crown prince. His distant mother and desire for freedom are represented by a beautiful Swan that will eventually betray the prince. Graeme Murphy’s for the Australian Ballet (2002). The figures of Rothbart and Odile are represented by a single character – the Baroness Rothbart – who snatches Siegfried away from Odette. The latter is committed to a sanatorium, thus the white act (Act II) is Odette’s hallucination and the swans a projection of her troubled mind. In a recent Twitter poll taken by @tufftufftuffin, Swan Lake won as the voters’ favorite ballet music. But what we now recognize as Tchaikovsky’s score probably sounds very different from his original 1877 arrangement, given the substantive reworking by Riccardo Drigo and Modeste Tchaikovsky for the Mariinsky 1895 production. For a full comparison and list of differences between the original and rearranged scores (Drigo’s is now the standard for most companies) we recommend this very lengthy Wikipedia article, as well as this blog post from You Dance Funny that examines all musical possibilities for the Black Swan Pas de Deux coda. Swan Lake was the first ballet Tchaikovsky composed. Years earlier he had began working on a score for Cinderella but he seems to have abandoned the idea, of which no records survive. In 1871, after spending a summer vacation with his sister Alexandra “Sasha” Davidova and her children, he composed a miniature ballet called The Lake of the Swans. He would return to this composition when engaged by the Bolshoi Theatre, also lifting fragments from his opera Undine. The new score was completed by April 1876. In letters to his friends and family Tchaikovsky explained that his motivation for undertaking the work was partly because he needed the money (he received 800 rubles for this work) and partly because he wanted to try composing for ballets. Swan Lake would eventually change the public perception of music for ballet but, at the time, Tchaikovsky did not realise he had written a masterpiece. He was under the impression that Delibes’ score for Sylvia was vastly superior to his own work “…what charm, what wealth of melody! It brought me to shame, for had I known of this music, I would have never written Swan Lake”. No 1. Scène – Allegro. No. 13. Dances of The Swans . 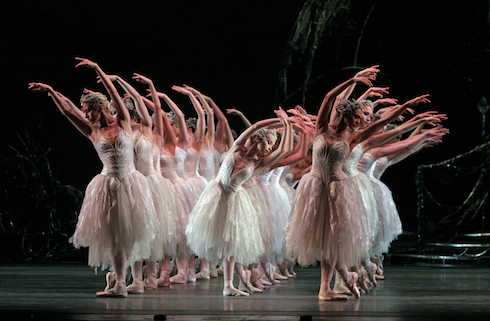 Australian choreographer Graeme Murphy’s Swan Lake is amazing. It’s a modern take on the traditional ballet and is beautifully done. Thanks Henrik. There are more in the pipeline so stay tuned! Many thanks for your comment. We’re really glad you mentioned this tidbit about Murphy’s Swan Lake – we had read as part of our research that he had indeed been inspired by the whole Camilla/Charles/Diana affair – but there are often bits that end up in the cutting room floor as we try to cram so much in. So again, thanks for mentioning it. We’d love to see this version someday! I’m glad you mentioned the Australian Ballet/Graeme Murphy version – but what you didn’t mention (and perhaps didn’t know? Have you actually SEEN this version?) is that (partly because it’s costumed in modern clothing, mostly) it’s generally seen as an analogy for the Prince Charles (Siegfried)/ Princess Diana (Odette)/ Camilla Parker Bowles (Baroness Rothbart) triangle. Siegfried has a relationship with the Baroness before he meets Odette. The latter ends up in a mad-house, cared for by nuns (possibly of the same order as The Flying Nun a la Sally Field) whose habits make her think she’s surrounded by swans.